Bedrooms: 4 - Master Bedroom with king size bed, Bedroom 2 with Queen-size, bedroom 3 with Queen size and, Bedroom 4 with two singles and a futon - matrimonial size. More Facts, Pictures, Rates below. 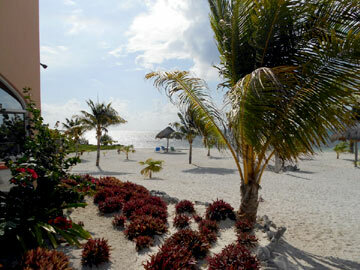 Beautiful Costa Maya at your doorstep! This 5000 sq ft sprawling house sits on 48 meters of one of Mexico's most beautiful beaches "Coconut Beach" located south of Cancun and one and one-half hours from the Belize border. 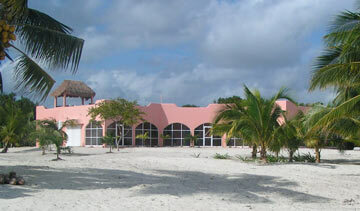 Casa Porto Vino is privately owned by an Atlanta, Georgia couple who love the Costa Maya and the Caribbean. 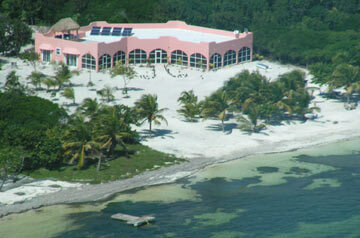 Mayan Beach Garden is proud to make this elegant house available to you in their behalf. 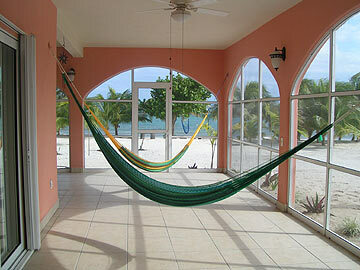 It is by far the most spacious and comfortable Beach house on the Costa Maya at a great price. 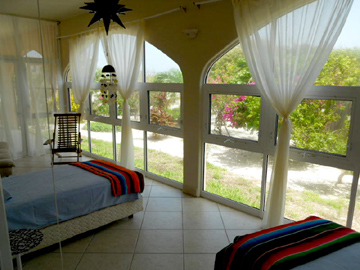 This house has more space and privacy than you will ever get on the Riviera Maya and continually gets 5 stars by its guests! 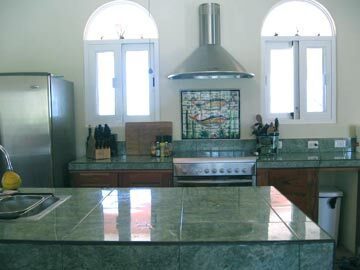 Beachfront: The 5000sq ft Casa sits 100' from the Caribbean's warm water. 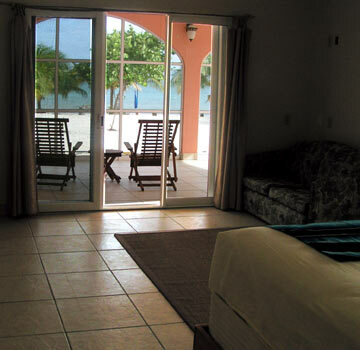 With unobstructed views of white sand from the house to the beach. 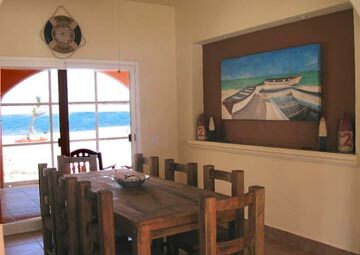 Casa Porto Vino has a sandy beach that is minutes from great snorkeling. With Jungle in the rear and on both sides, Casa Porto Vino is quiet and secluded (yet close enough to Mayan Beach Garden if you want to stroll down the beach for dinner!). A word about the beach at Casa Porto Vino. . . it is perfect. People ask about a swimming pool, but who needs a pool when the tide pools in front of the house have soft silky sand - perfect for newbie snorkelers, non-swimmers and anyone just wanting to take a dip. 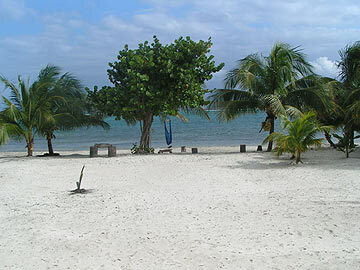 The beach is unique here - in all of Costa Maya, there are few places that have this type of calm beach. 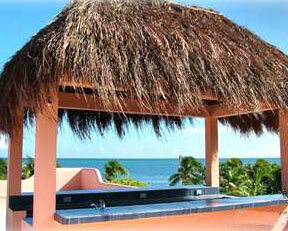 This one level with rooftop Palapa covered bar with views of the Caribbean make your eyes melt. At night the stars are spectacular; you can relax bar side and watch the shooting stars as the dance across the sky. 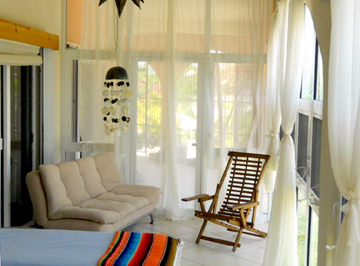 The Casa offers 11-foot ceilings and 21 ceiling fans, allowing the Caribbean breeze to follow through the 11 screened sliders. 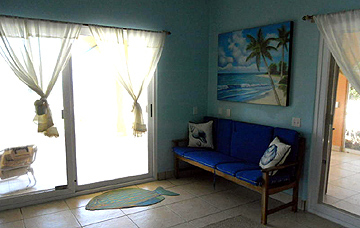 The screened beach side porch is 1200 square foot of additional living space. 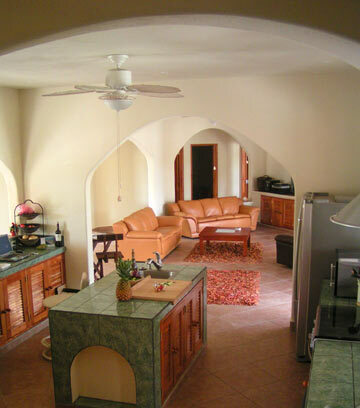 The Casa is fully furnished with everything you want or need for entertainment and entertaining! Guest Quote: ". . .This has been the best experience of our lives. The memories we have will pale in comparison to any other trip we have taken. Thank you for the wonderful home. It is beautiful. We are all now hooked." The Master Bedroom is truly a luxurious space. From the elevated and incredibly comfortable King size bed to the Caribbean view you wake up to every morning, you will feel pampered. 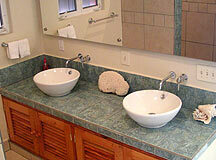 The Bathroom off the master bath comes with two above counter sinks, walk-in closet and large sized shower stall. Bedroom includes futon sufficient for two. 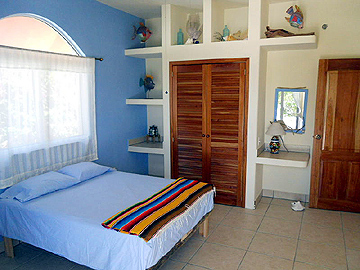 Casa Porto Vino has three bedrooms (Master Bedroom pictured above.) . 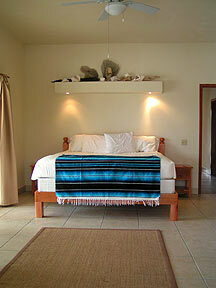 The spacious 2nd and 3rd bedrooms have Queen sized beds. The beach side deck is 12'X99' covered with all arches open to beach. 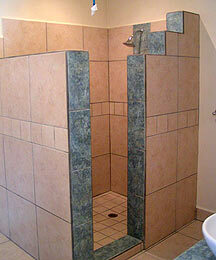 There is a one time cleaning fee of 125..
Casa Porto Vino requires a $500 security deposit . The security deposit will be mailed to you within 15 days of your departure. For each additional person over 8 there is a $20 charge per person per day. 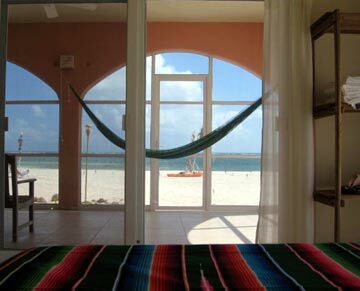 Queen-size bed looks out onto the screened porch and unobstructed view of the beach and kayak. Early morning sunrise shines through the window in this elegant kitchen with large island, complete with sink . Guest Quote: ". . . It was the best vacation we have ever had. Thanks to you and Kim for everything. The house was great. The people we met were wonderful. 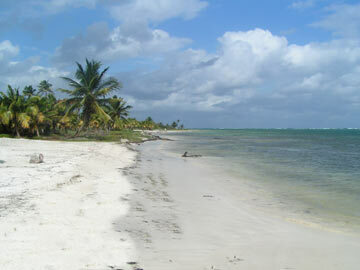 Mahahual is a terrific town. It was everything a vacation should be. We are still on Island time. I can't wait to come back. We are already talking about returning in the next year or so. . The beaches in front and both north and south of Casa Porto Vino are pure white sand, great for swimming or just beach combing. The beach is unobstructed by Mangroves or other items enabling you to walk for hours in either direction. Yes, the house REALLY does have an outdoor fireplace in the screened porch. Why you might ask? On the occasional cool night in December, you won't have to come inside. 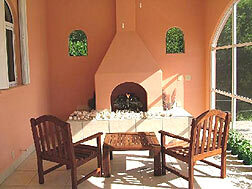 Enjoy dining or simply sitting enjoying the comforts of a good glass of wine and the glow of a fire. Master Bedroom has wet bar. 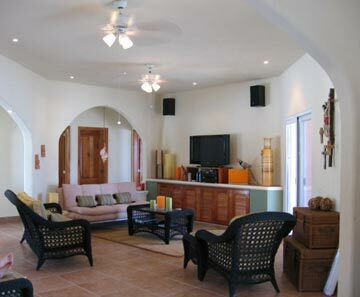 Casa Porto Vino Entertainment Center -- Everything you need, including flat-panel TV, DVD player, movies, SKY TV. . . .but who has time for TV when there is that great beach? To the right - view of the Master Bedroom couch. 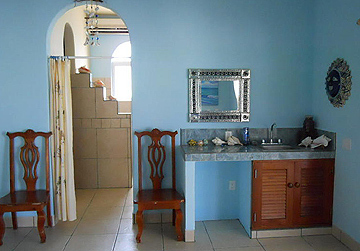 Wake up every morning to 180 view of the Caribbean. Bedroom #2 - is all about the view. 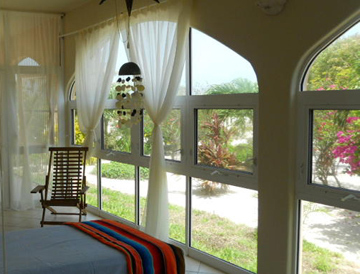 It opens onto the wide screened porch and out onto the beach. Bedroom has Queen size bed. 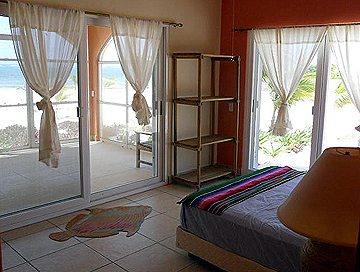 Bedroom #3 has queen-size bed and sliding glass door that exits to private Patio. The 4th Garden View bedroom has two single beds and a matrimonial sized Futon (pictures to the right). 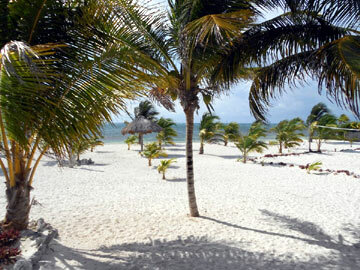 Peace, quiet, luxury -- This is without doubt the most spectacular property on the Costa Maya. Pictured below - a volley ball court and expansive beach provide a spacious sandy playground and lots of privacy with no immediate neighbors. Turn the radio on loud and have an unbelievable time.